Discussions are continuing on the proposed VIA Rail line that would run between Toronto and Quebec City with stops in Peterborough and potentially Kawartha Lakes. 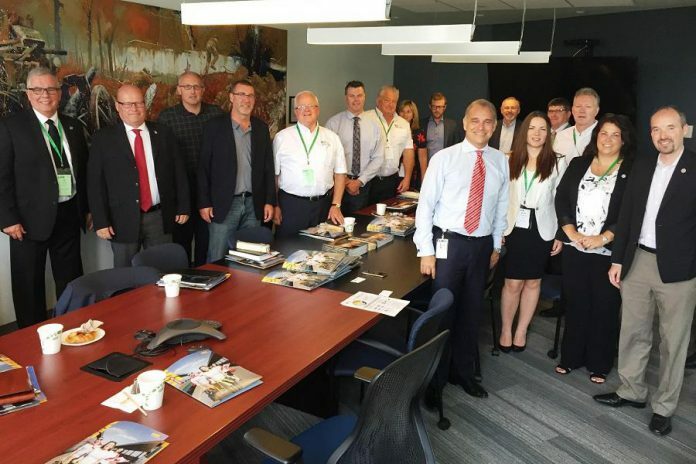 Earlier this week, City of Kawartha Lakes Mayor Andy Letham and CAO Ron Taylor met with VIA Rail executives in Ottawa, alongside Mayors and Wardens from Eastern Ontario municipalities, to continue discussions on the expansion. The proposal is to rebuild existing train tracks to create a high-frequency commuter route through the southern portion of Kawartha Lakes. City officials have expressed interest in having a stop in Pontypool on the way to Peterborough. In November 2016, VIA Rail President and CEO Yves Desjardins-Siciliano announced the plan for a new passenger train service between Toronto and Quebec City, with a stop in Peterborough, at a Greater Peterborough Chamber of Commerce lunch. The plan is part of proposed $4 billion expansion for high-frequency rail in the Montreal-Ottawa-Toronto corridor. The plan, still in development, has already proposed stops in Peterborough, Tweed, Sharbot Lake, and Smiths Falls in Central and Eastern Ontario. If ultimately approved by the federal govermment, the plan could see the new rail service in place by 2020-21.